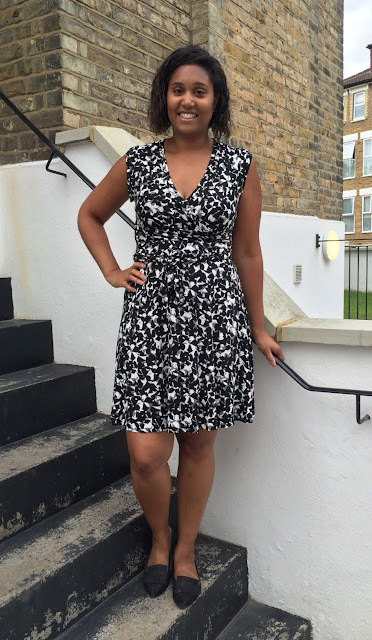 I am back with yet another wrap dress. This is my second iteration of New Look 6301. I can't get enough of wrap dresses. They are so comfortable and easy to wear. This will be number 4 on my blog! Here are the links to dress 1, dress 2 and dress 3. 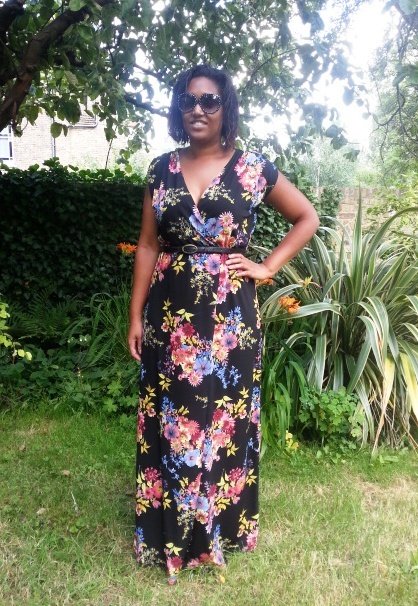 I don't have too much to add that I didn't blog about in my last wrap dress post. One thing that I did notice is that as this fabric has much more stretch I did find that the bodice is a tad larger than last time. However it is not noticeable with the busy print and still fits well. I knew that I would definitely be rotating this in the work wardrobe so I only removed 3 inches off the skirt hemline this time. This will be a transitional dress so I am looking forward to pairing this with tights and a black cardigan in the Autumn months. 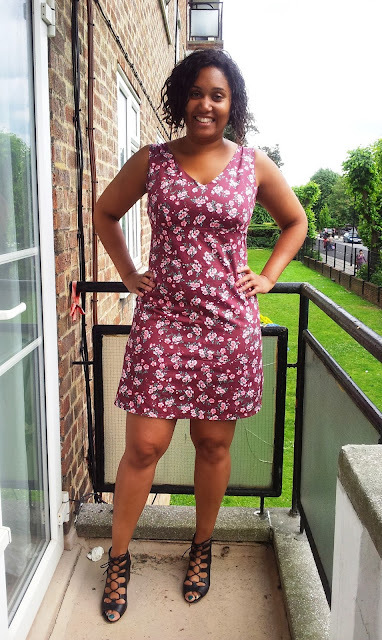 Despite having lots of dresses cut out and on my sewing table I didn't have much in the way of hand-stitching to take along to this month's sewing group meetup. This inspired me to sew up the Flo-Jo Boutique eye mask making kit and did this in two leisurely hours whilst chatting and drinking tea! The kit comes with everything you need except scissors. This includes fabric, pattern, instructions, pins, needle and thread. The instructions are very easy to follow and everything is sewn by hand, no need at all for a sewing machine. My only (and extremely trivial) dislike was that I felt the needle provided was too large for the types of fabric being used. Anyone with any sewing supplies will be able to substitute this, but I did feel that the needle was really quite thick.